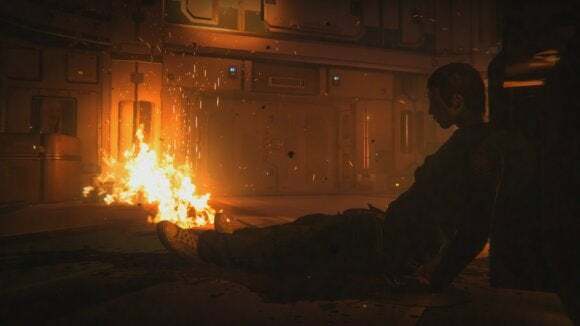 Something has breached the quarantine zone on the decommissioned space station Sevastopol, and since this game is called Alien: Isolation I have a pretty good idea of what it is. As I creep down the hallway of the mostly-abandoned medical wards, one of the ceiling lights clatters to the ground and a long, undulating ribbon of black unfolds from the ceiling. It's horrific. It's spectacular. It's the Alien. The Alien lands with hardly a sound, crouched like it's ready to pounce. I crouch under a nearby gurney, subconsciously holding my breath. It's tense. The Alien stalks off down the hall, and after a few hesitant steps into the open I creep out from my hiding spot and head towards my next objective. 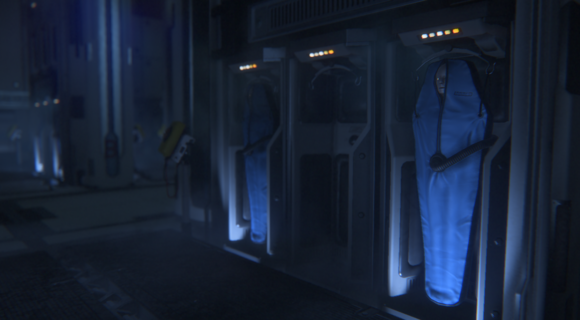 This is Alien: Isolation at its best. Halfway to the objective, I come around a corner and find the Alien waiting for me. I die. I restart from my last save point. I hurry back to the cutscene trigger—the ceiling light falls down, the Alien comes out of the ceiling, I hide under the gurney, it walks off, I walk off. This time I'm caught trying to mess with a door's access panel. I die. I hurry back to the cutscene trigger—the ceiling light falls down a third time, the Alien comes out of the ceiling, I hide under the gurney, it walks off, I walk off, I die, I hurry back to the cutscene trig—you get the idea. This is Alien: Isolation at its worst. 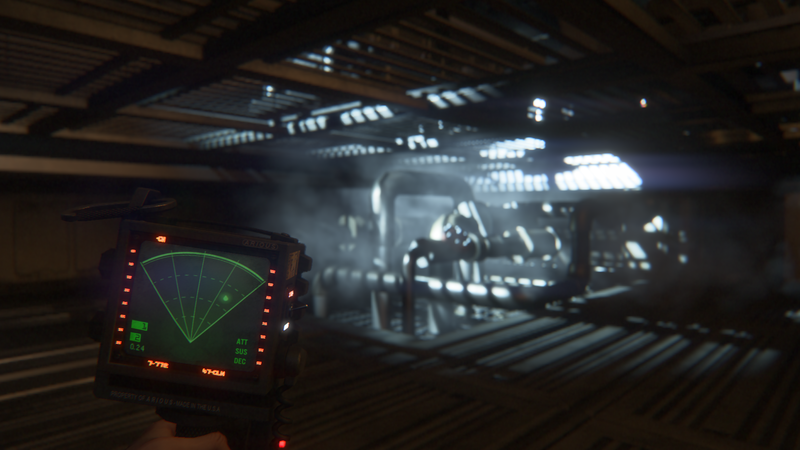 Alien: Isolation is a first-person horror/survival game based off the best film of the franchise, a.k.a. Alien a.k.a. shut up, Aliens fans, because you're wrong. 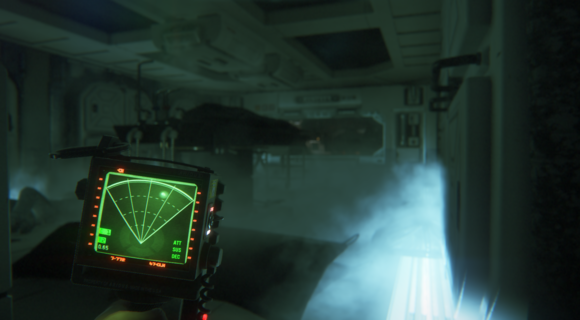 As such, Alien: Isolation is mostly about creeping through the dark (and excellently realized and rendered) corridors of the Sevastopol and making sure nobody comes and kills you. You're not gunning down hordes of enemies, you're not murdering dozens of Aliens. You're scared and you're fragile. 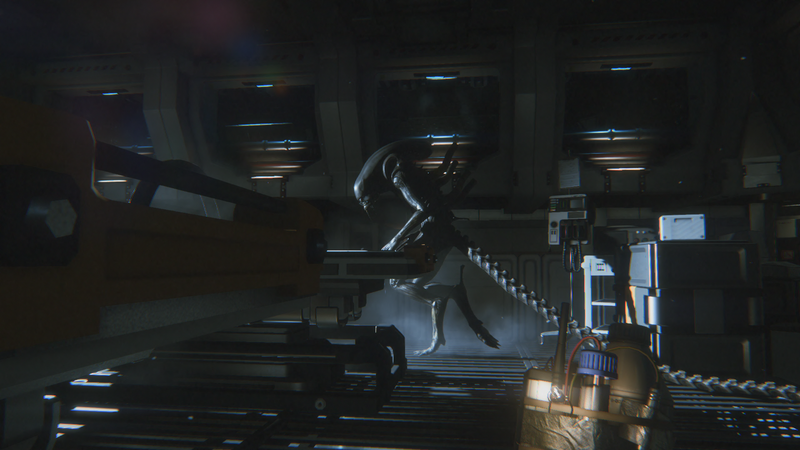 Alien: Isolation is better than Aliens: Colonial Marines. Let's get that out of the way. There's been all sorts of talk from people saying, "I don't want to play Isolation because Colonial Marines was garbage." That's silly. They're different games. Obviously I can't vouch for the entire game right now, so I won't. What I've played though? It's good. Not incredible, but it's not a train wreck of a game like Colonial Marines. The Sevastopol is perfect. The tech is the beautiful retro-futuristic style of seemingly all '70s and '80s sci-fi films, replete with computers that need tapes for storage and clunky CRT monitors. Your main "weapon" is a motion tracker, which you can pull up to see whether the Alien is nearby. Of course you have other weapons, too. Yes, despite initial indications that Alien: IsolationA would be a combat-free game...well, it's not. There are enemies. Sometimes those enemies are humans. Sometimes those enemies are androids. The combat is mostly interesting when it involves both humans and the Alien—multiple times I had humans fire shots at me, only to watch the Alien run in and kill them all. Silly humans. Like so many horror games, Alien: Isolation is a tender balance. When it's working—when you believe you're in danger and believe in the Sevastopol, everything from the Alien's swishing tail to the hissing noise of the vents is enough to put you on edge. But Alien: Isolation has the same "problem" now as it did the first time I saw it—it's damn hard. Maybe too hard to actually be a horror game. Let me explain. As soon as I got into the demo I turned it down to Normal difficulty (it was originally defaulted to the hardest difficulty), and even so I died repeatedly. It almost became a joke. I ate lunch with a few other journalists after two hours of demo time—we were given an incredible amount of time with the game, putting in almost four hours total—and the four of us talked about how far we'd made it. I'd made it to the end of the first demo level. Another journalist had started the second level. The other two were still about halfway through the first level. Now, a perfect run of this level—one where you went start-to-finish without dying—would probably take 30 minutes, max. We'd spent four times as long, and only one of us had finished the section. Difficult games are not a problem. Difficult horror games? Well, those concepts are at odds as far as I'm concerned. The first time I saw the Alien unfold from the ceiling it was stressful, as I cast about for a hiding spot. The second time I hid was tense. The third time it was tedious. The fifteenth time I retried the same damn section, the Alien was just an obnoxious video game obstacle for me to contend with. That's not a problem with the game necessarily, but it is a problem with how Sega's positioned the game. Sega's talking this up as a horror game, but it doesn't feel particularly scary to me. It's really hard to feel afraid of something you've experienced a dozen times over. My time with the game also revealed some issues with the Alien's AI, which has been talked up in the past for being "realistic." Back at GDC I was told that the Alien would react appropriately to environmental cues, such as checking doors, et cetera. Instead the Alien seems consistently unfair, sticking unconscionably close to the player even in wide-open levels, as if it "knows" you're in that area. Even if it's never seen you there. Even if it shouldn't know you're there. It also cheats. I'm pretty sure the Alien is pre-loaded into certain areas as you enter them, so even if you thought you outsmarted the Alien and left it behind in the last section of the level, walk into the next section and it somehow made it there ahead of you. This is particularly noticeable if you walk into a new region and then back into the old one. First you'll see the Alien in the new section, then it'll be back in the old section of the level before you even round the last corner. That's cheap. It's an artificial constraint on player creativity, as if to make sure they can't really get away from the Alien. Oh, and despite the discussion of dynamic shadows back during GDC, your character still doesn't have a shadow. It's also hard to tell what your "body" is in the game, which wouldn't be an issue except levels are full of large metal tubes and fire detectors and the like, which love to clatter to the floor and alert the Alien to your position. When you can't tell where your "arms" or "legs" are, it's like trying to navigate through a shop full of expensive vases, except you're the Wacky Inflatable Arm-Waving Tube-Man. No more demos. I want to play Alien: Isolation all the way through, start to finish, from the comfort of my own darkened bedroom—alone, with headphones on, the way every horror game is intended to be experienced. I want to see the game's difficulty rise in a natural progression instead of being thrown into a random section. 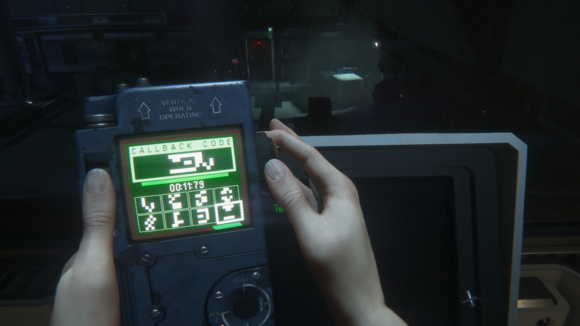 I want to see what it's like to actually learn from the Alien's behavior instead of blindly stumbling my way through levels—it's awkward trying to determine whether a game is "too hard" from a demo. I just want to play it so I can tell whether my opinions in this preview are justified or not. A lot of people are really looking forward to this game, and as a horror fan I'm always up for creeping through dark hallways. I worry, though, that in trying to make the Alien feel lethal—and thus scary—the developers have instead made it too deadly. That's a fine line, and only the end product will really substantiate or dismiss my fears. Alien: Isolation launches October 7 for PC, Xbox One, PS4, Xbox 360, and PS3. Stock up on spare pants. Or maybe spare controllers.